Thursday, June 26, 5:30-7:30 p.m.
Public is invited to meet and mingle with the artists. View of the gallery from the lobby. The Los Gatos Art Association (LGAA) and The Museums of Los Gatos are collaborating again! David Stonesifer, the LGAA award-winning artist and Los Gatos Arts Commissioner, and Larry Arzie, also long-time supporter of the arts in Los Gatos, have offered their recently vacated gallery space at 24 N. Santa Cruz Avenue in Los Gatos (formerly Tercera/Linda Durnell Gallery) for the summer months. Artwork by Los Gatos artists who have previously exhibited in The Art Museum of Los Gatos shows, or were juried into a LGAA Member or Open-Juried Show, will be featured in the popular gallery space on Los Gatos' main thoroughfare. 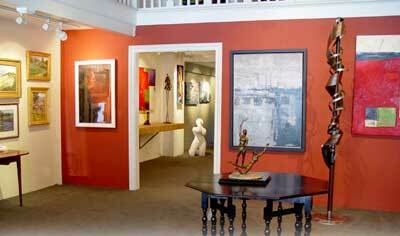 Artists will share a portion of each sale with The Museums of Los Gatos. "We want to raise awareness," Stonesifer said, "so that the art profile doesn't wane while deciding on a new tenant." The Gallery features original works in a wide range of subject matter and styles using fine art media including oil, acrylic, dry media, wet media, mixed media, printmaking and sculpture. Gallery Open Tuesday through Saturday, and some Sundays: Each day an LGAA artist will be on site at the 24 N. Santa Cruz Avenue gallery and some will do live demonstrations as part of the Got Art? Gallery exhibition. Bring your family, friends, out-of-town visitors and fellow art lovers, and snag this opportunity to take home one of your favorites from this amazing local collection!